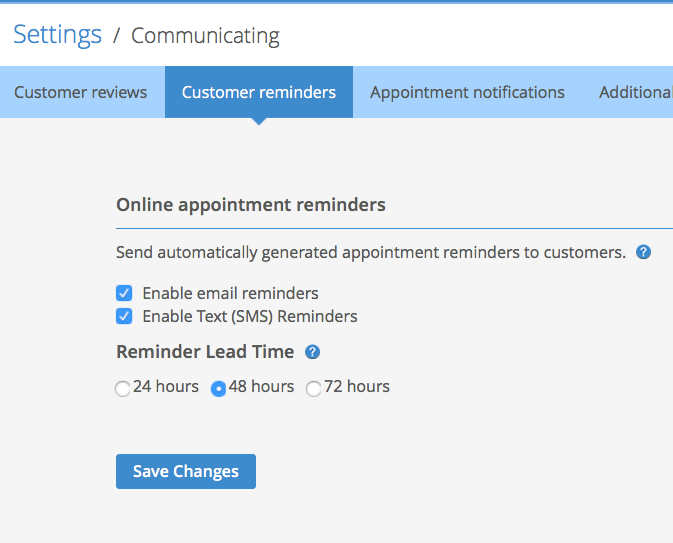 Remind customers of their appointments via email and/or text message. 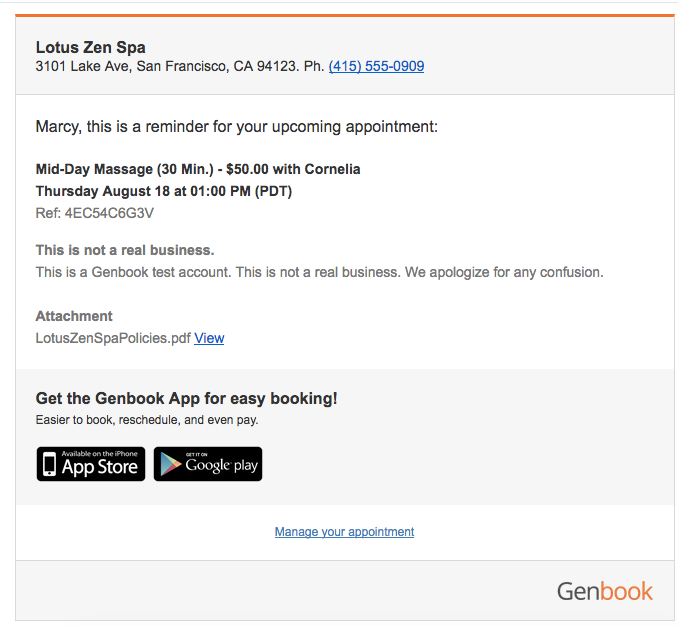 To help your business reduce no-shows and keep your busy clients up to date with upcoming appointments, Genbook lets you send automated appointment reminders by both email and text message (SMS). The Customer Reminders feature is found in Settings (gear icon at the top right), under the "Communicating" section. You can choose to send reminders 24, 48 or 72 hours before an appointment, via email, text or both. Reminders are sent for both Online appointments (those your customers make using your scheduling page or the Genbook app) and Offline appointments (those you add manually via the web or Manager app). TIP: In order to prompt reminders, an appointment must be created at least 24 hours before the reminder lead time. So, if your reminder lead time is 48 hours, the appointment must be made at least a full 72 hours in advance for reminders to be sent. If your business takes mostly appointments made just a few days in advance, we recommend using the 24 hour reminder lead time. Text reminders contain the basic details of your clients' appointments: Your business name, and the time and date of the appointment. Reminder emails contain much more information than their text message counterparts They include the Confirmation/Reference # for the appointment, the service and staff member, time and date, as well any confirmation messages or confirmation attachments you've added.